That Owl | Nothing more than a blogger who is writing what she sees. Australian animal activists are struggling to comprehend the heartlessness of the actions of our ‘leaders’. 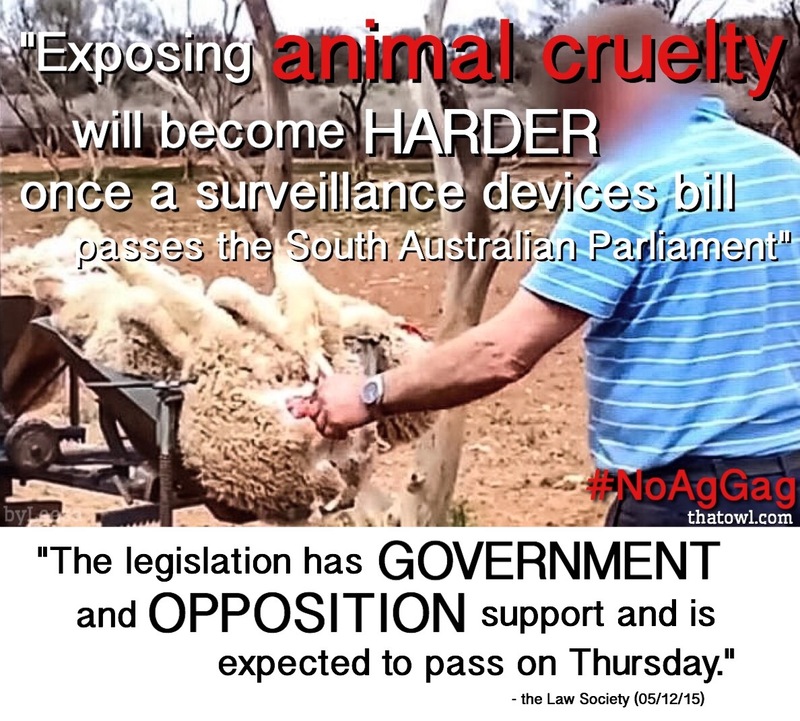 Both the South Australian Government AND the Opposition are in support of ‘ag-gag’ legislation which is expected to pass this Thursday. Ag-gag laws are put in place to protect companies from scrutiny, despite the unbearable consequences to the animals that this legislation with impact. So what can we do to combat this legislation? Plenty. Contact your local MP: this useful resource will enable you to find and contact your local MP. Sign the petition: you can sign Animals Australia’s petition here. Get informed: visit Voiceless to further your understanding of these laws and the impact they have on animals. Utilise Social Media: you can contact your local MP publicly via Facebook and Twitter. Leaving a public message will help to inform others while simultaneously pressuring leaders to do right by voters, and more importantly, by animals. Hashtags are greatly effective. 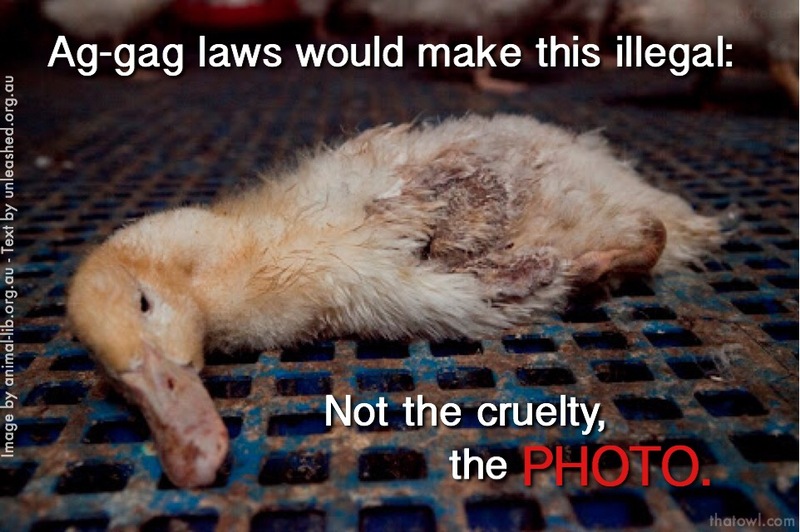 Try to include tags such as #NoAgGag and #AgGag to anything you post/tweet on the subject. You can also share facts/memes/links as comments on applicable articles and posts on websites and social media. Comment sections are often a hotbed for debate and contributing your informed opinion often makes a world of difference. Spread awareness: so many Australians are unaware of the atrocities being committed in the agricultural business and/or the fact that our representatives are acting to aid in concealing this. What’s more, a vast majority of these unaware or misinformed Australians consider themselves strongly opposed animal cruelty. We cannot control what is being decided on our behalf in Parliament, but we can certainly do all we can to influence it. Our silence is not acceptable when those who are facing abuse do not have a voice of their own. This entry was posted in Animals and tagged ag-gag, animal anuse, animal cruelty, animals, farming on December 5, 2015 by leesalittle. According to Dastyari, Labor was content to drag out their “tax campaign” even longer than the two years that they’ve already let pass by. How much longer do they think they have? It seems as though they’re already assuming a loss at the next election and that negotiations with the Liberals would continue for months (or years). 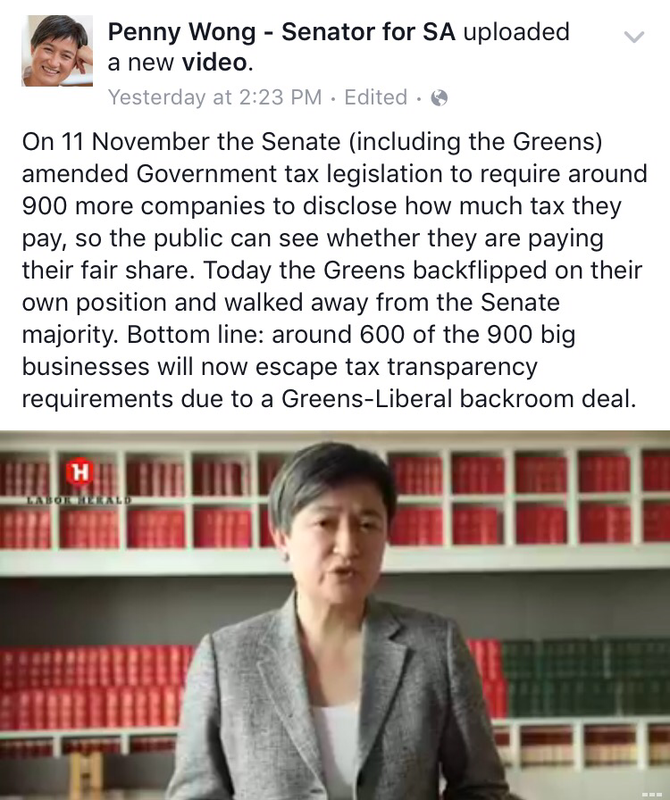 Not good enough, Labor, we need tax transparency now. Thanks to the Greens we now have that. If it’s not to the extent that is desired, that’s the price we pay for electing the Coalition. For Labor to want to drag this out further in the hope that they could change the stance of the Liberals is ludicrous. And even if they could make them budge slightly, how much longer would that take, and would the wait have been worth it? But this is all beside the point. 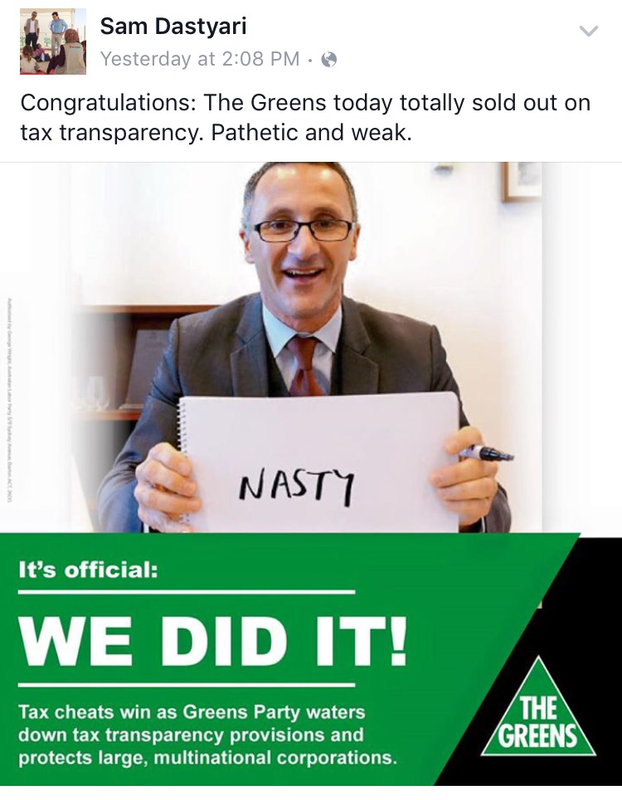 Not only did Labor stall on such an imperative deal, they also seized the opportunity to diminish the Greens’ reputation in an attempt to sway any left-leaning swing-voters away from the Greens. In doing so, they’ve created an unnecessary rivalry which only serves to help the Liberals win the next election. Perhaps most disappointing was Penny Wong’s involvement. An admirable woman who seemed to be above the LNP-style slandering, Senator Wong has always been a sentimental favourite of many. But thanks to the grandstanding yesterday, along with that of the rest of their party, Senator Wong, and subsequently, the Labor Party, has lost my support, and that of so many others. 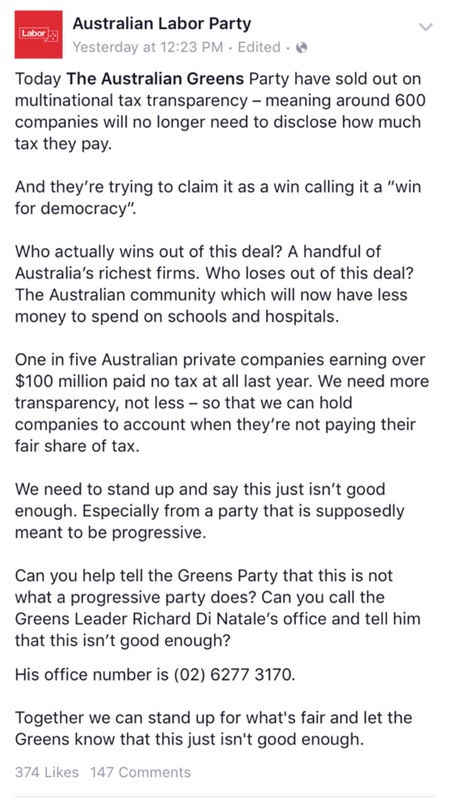 The official Australian Labor Party Facebook page also got in on the action a few hours prior, urging followers to contact Senator Di Natale personally by publishing his direct phone number. This was accompanied by a mass-email from Shadow Minister Chris Bowen urging supporters to do the same. 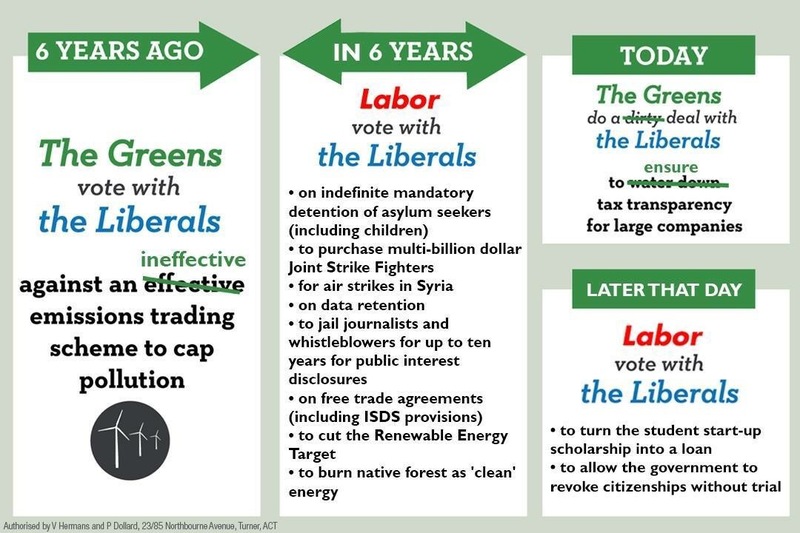 To add fuel to the fire, Labor Senator Sam Dastyari also posted a meme that was designed to emulate an official Greens image, even (perhaps illegally) using their official logo. 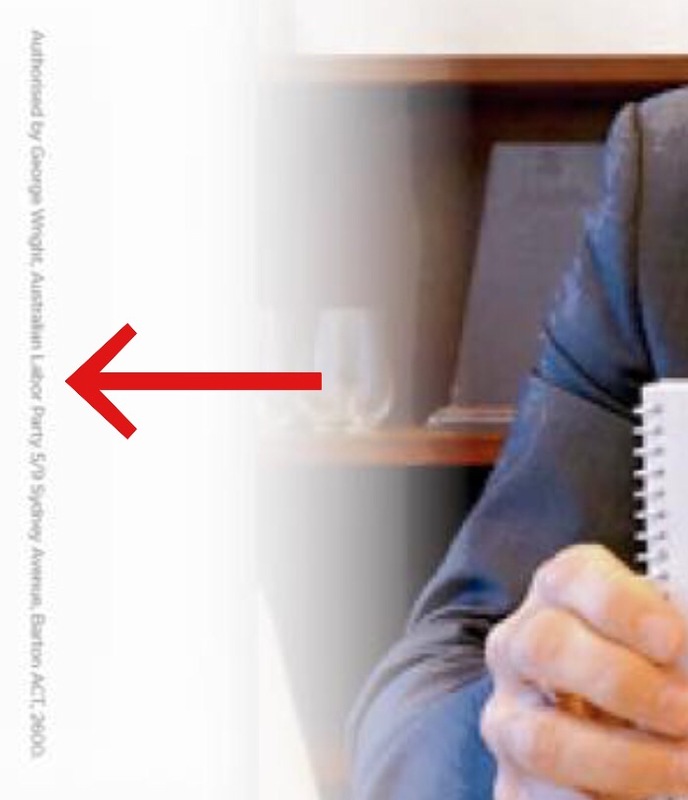 Above the Greens’ logo there is a portion of the original image, indicating that this rush-job absolutely was thieved by Labor. 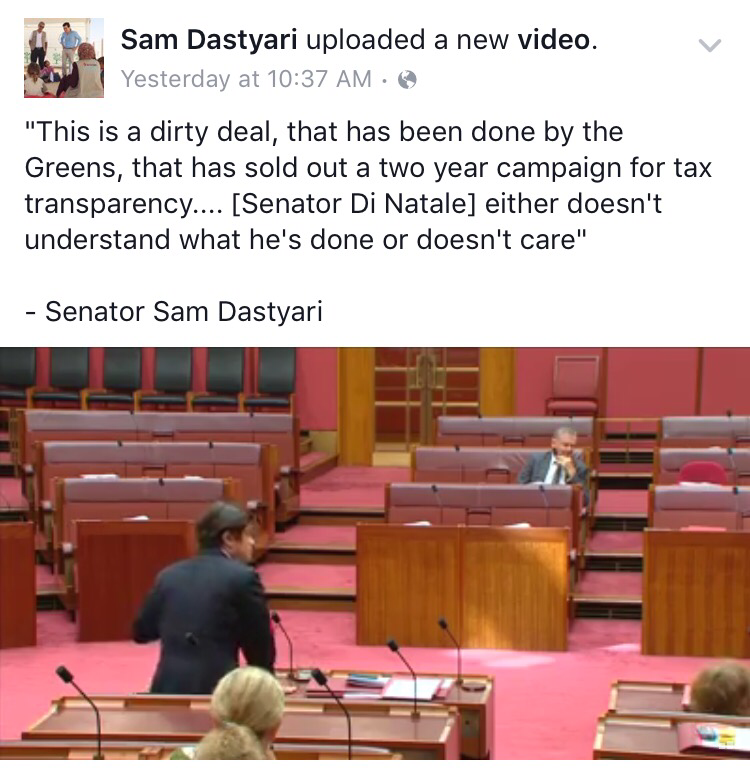 What’s even more dumbfounding is that this was not a rogue action on Dastyari’s part. This is actually a Labor-authorised image. Labor’s fault here is threefold: they delayed taking any genuine action on the issue of big-business tax transparency for over two years; they have been spending their entire Opposition term (virtually) in hiding, except when they emerged to vote WITH the Liberals on issues that their supporters begged them not to (eg. data retention); and finally, they took this one instance as their opportunity to begin a smear-campaign against the Greens, all while giving the LNP a free, unopposed ride throughout this entire term. There are simply no words for how unethical, unbelievable and unnecessary this is. Labor has overstepped their bounds and for what? Perhaps they feel that the Greens are a gentler target than the Liberals and less likely to come back swinging. Or perhaps they’ve finally noticed that they’re losing supporters by siding with the Liberals on key issues, but instead of reconsidering their stance on said issues, Labor is attempting to deflect by drawing attention to the one time this entire term that the Greens have struck any sort of deal with the Liberals. No matter what the reason, Labor’s actions were completely uncalled for. These dirty Liberal tactics are best left to the smear campaign experts themselves – the Liberals. At the very least they should be aimed at the Liberal Party, not the closest thing that Labor has to an ally. 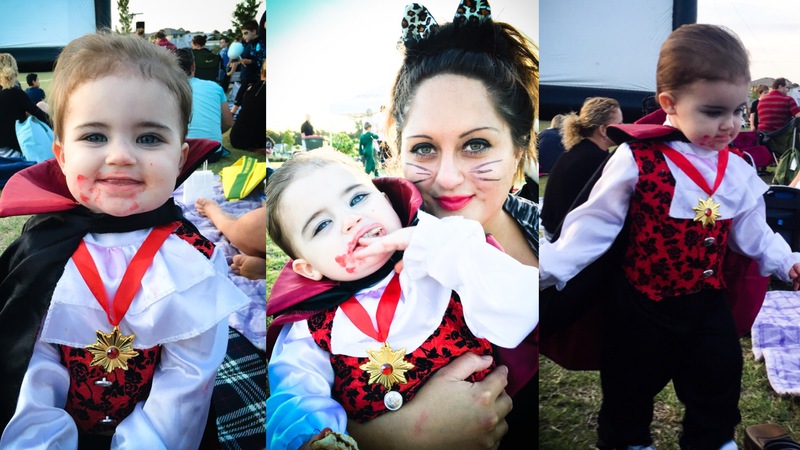 This entry was posted in Politics, Uncategorized and tagged alp, auspol, greens, labor, lnp on December 4, 2015 by leesalittle. Left: Horse-drawn carriage in Melbourne. Right: Wild horses living naturally. When I was young, I always dreamed of riding on a horse-drawn carriage through NYC. It was such an overly-romanticised idea that was irresistible to even the most cynical of people. Strangely, it was while watching the episode of Seinfeld wherein Kramer looked after one of these horses that I began to question the ethics of such a practice. It was an odd notion to me at 8yrs old to view an animal as a vehicle, let alone one that was expected to compete with cars, buses, trucks etc. on busy city roads. Yesterday this video emerged of a horse that collapsed on the streets of Melbourne. The person who captured the video alleged that the horse collapsed due to dehydration, which would seem a more than likely scenario. Though, the owner, Dean Crichton, from Unique Carriage Hire, has since threatened that they’re considering legal action against the Melbourne teen, claiming that the horse was not dehydrated. Regardless, the scene was a horrid sight. The video did not go viral because of the concerned teen’s assumption that the horse was dehydrated, it went viral because it was a wake-up call to Australians that a most-likely terrified horse was helplessly collapsed in the street, surrounded by cars and people. Somehow this is still an acceptable and apparently lucrative practice. Perhaps it is the lack of knowledge that leads people to believe that this is an acceptable practice, but most likely it is due to their cognitive dissonance. We’ve learned to live with the idea that animals are nothing more than tools, food, entertainment, etc. but isn’t there something wonderful in the idea of evolving beyond this? Imagine a horse in the wild – in its natural environment, roaming free. Now imagine a horse, battling traffic, breathing toxic fumes, braving the scorching heat with no respite and hauling heavy loads every single day. And for what? For a moment of perceived joy in some person’s life. I would wager that most who choose to pay for the trip wouldn’t do it twice for sheer lack of interest and would enjoy the journey for perceived nostalgic purposes only. An injured carriage horse in NYC (click for source). The above is devastating to me. The footage, even more painful. But what is confusing is that not everyone feels this way, and that people still continue to legally use these old-fashioned gimmicks in the streets of Melbourne. Aren’t we better than this? In an age when we are finally starting to collectively understand the cruelty involved in greyhound and horse racing, how are we not aware of the impact that pulling a heavy cart on asphalt has on horses? Aside from the actual car vs. horse accidents that occur, the day-to-day damage to these horses is undeniable. Their legs suffer from beating the asphalt each day. It is painful and dangerous, because once their legs give out, they are deemed permanently useless. Then of course there’s the impact on their lungs. Imagine having to walk through traffic day-in, day-out. How do you think your lungs would handle the fumes? We barely keep our windows down in traffic due to the overwhelming toxicity of petrol fumes – how we expect these gentle giants to deal with it is beyond comprehension. In some instances, (and perhaps narrowly avoided yesterday), horses have dropped dead from heatstroke after working in harsh heat and humidity. Many claim that the drivers of these cruel modes of transport “love and respect” these animals. I greatly beg to differ. In an article about a horse that had the carriage collapse on it when it was spooked in Manhattan traffic, the driver openly blames the horse and offered it no care or concern. To add insult to the horse’s (literal) injury, the driver was witnessed “shouting at the horse” before the crash. One witness said “it looked like the driver was having a fit. 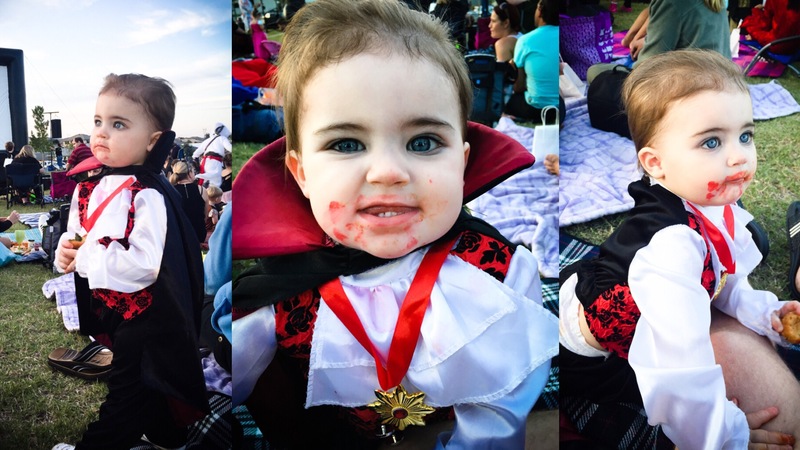 He was screaming. He couldn’t control the horse,” So much for love and respect. 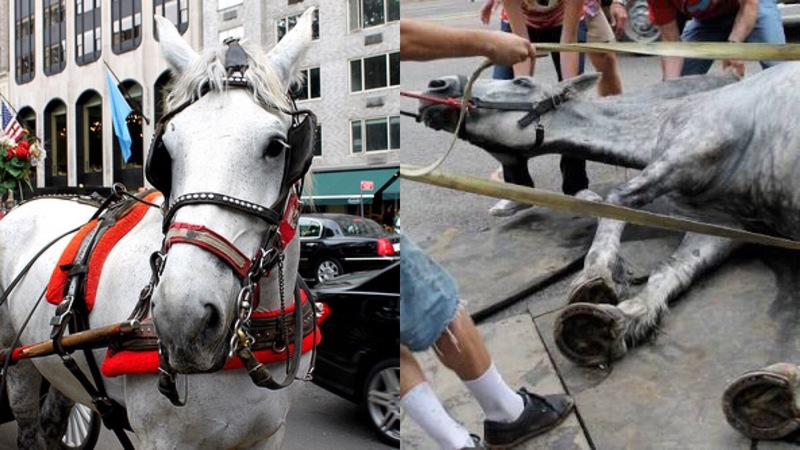 What ‘love and respect’ looks like – a horse spooked and subsequently crushed by its cart in NYC (click for source). Perhaps it’s years of conditioning – being immersed in a society where we believe that horses belong in saddles and bridles. But if you think back to what a horse is supposed to be; a gentle, free, wild beast, it is absolutely heartbreaking to juxtapose this image with what a horse is to us now. You can take action now by signing this petition and/or joining the ‘March for the horses‘ on October 9th, 12:30pm-2:30pm at Bourke St Mall, Melbourne. If you’re a Melbourne local, it’s worth following the page Melbourne Against Horse-Drawn Carriages. You can also take a stand by boycotting this cruel and outdated practice and urging others to follow suit. UPDATE: the teen who posted the video has apologised for the “misrepresentation” after being threatened with legal action. Somehow people view this as vindication for the carriage owner, rather than a pressured apology. Regardless of how or why the horse fell – whether it was a bite from another horse, dehydration or being spooked – people were still outraged to see this beautiful beast collapsed in the street because it simply did not belong there. Taking this post at face value is naive, just as it is naive to take the word of carriage drivers as gospel. Of course they’re defending the way they treat their horses, but that’s not the issue. Using them to fight traffic every day is, in my opinion, careless and vile. If you are curious about whether this is an ethical practice or not, don’t take anyone’s word for it, do a quick Google search. What you see might hurt you more than you think. This entry was posted in Animals on October 4, 2015 by leesalittle. Last night would have been confronting for high-profile animal activist, Jaylene Musgrave as she was asked to answer to some very genuine questions about her animal fundraising. A Facebook post from a keen-eyed member of an Australian Vegan group (of which Mulgrave is a member), began the speculation in which other responses seemed to support the suggestion that Musgrave’s fundraising practices are suspicious. 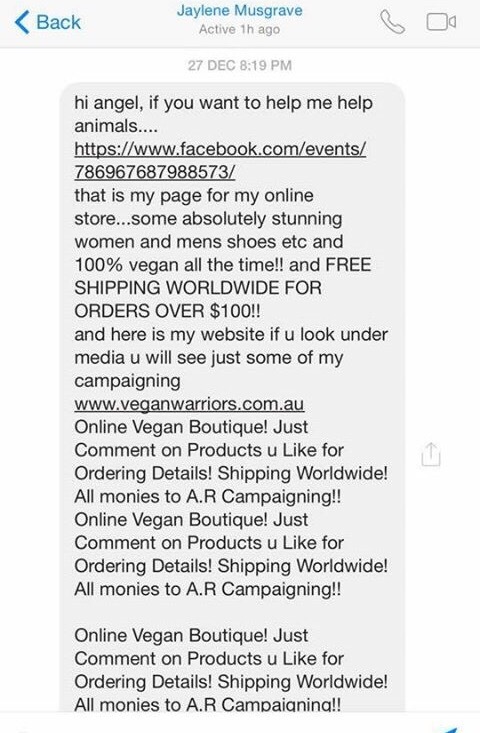 Touting herself as a “vegan warrior”, Musgrave has a highly complimentary explanation of her work as an animal activist on her own website, veganwarriors.com.au Therein she names celebrities and others of note who are her “supporters”, including Joan Jett who is named as an “ambassador”. Given that Musgrave’s legitimacy is being marked by supposed celebrity endorsements, it’s no wonder that there are many animal activists questioning the true destination of raised funds. Musgrave does her ‘fundraising’ solely via Facebook and receives payments only by direct bank deposit, never by PayPal. 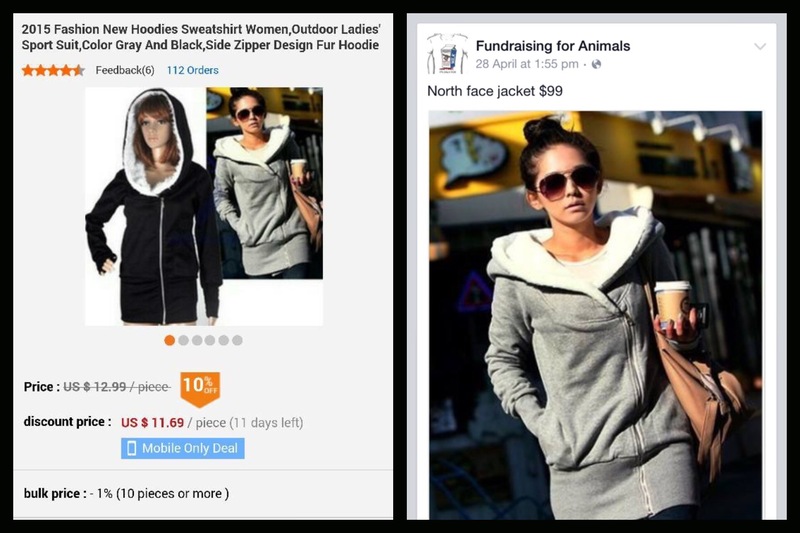 It has been noted by many that the clothes, shoes, handbags, etc that she is advertising on her pages, Vegan Warriors – Jaylene Musgrave and Fundraising for Animals are being sourced directly from eBay and other discount websites, and being sold for up to ten times the cost. The photos being used on Musgrave’s pages have been lifted directly from the original stores, indicating that stock is possibly not even in Musgrave’s possession. One rightfully confused buyer mentioned that she had just purchased an item from Musgrave for over $130, only to be told that she will “order them now” and it would take around 10 days to arrive. Taking all of this into account, it would seem that Musgrave is selling items that she has seen online, (using the photo that the original store has used), with a hefty mark-up. Without being sure, it seems that Musgrave is then ordering the product from the actual store (for a low cost) and having it posted directly to the buyer. The buyer then receives a low-quality item for a high cost with the remainder of the money going directly into Musgrave’s pocket. Left – the original eBay listing. Right – Musgrave’s Facebook post. This apparent scamming aside, the question now is, does that money then get passed on to an actual organisation or charity, or does it remain with Musgrave? As far as I can find, Musgrave has no listing as a business or charity, and no legitimate information as to where exactly the funds raised are going. In a generic message that Musgrave sends to new Facebook friends, she mentions that “all monies to A.R campaigning”. The problem is, A.R Campaigning doesn’t seem to actually exist, and if it does, I will gladly stand corrected. At the very least, it is almost impossible for Musgrave to know whether or not her products are ethically-made, let alone vegan. By using her name and standing within the vegan community to sell what is essentially a mystery product in terms of production, Musgrave has betrayed her own values and those who have trusted her enough to buy from her. 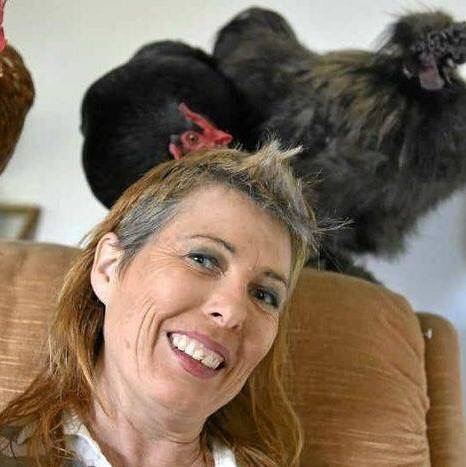 At the very worst, she has created a trusted persona amongst the animal activism community with the intention to dupe people into believing that they’re donating funds to the most vulnerable of creatures. If this is true, it is indeed a betrayal towards the animals that Musgrave purports to protect. This entry was posted in Animals, Uncategorized and tagged activism, animals, vegan, vegetarian on May 20, 2015 by leesalittle.